The new 7-inch Kindle Oasis comes with a couple of extra accessibility features not found on other Kindles. In the official user guide (PDF) there’s mention of a display size option that allows you to customize the page layout and display preferences. Apparently you can choose to use a large mode to increase font size to help with better readability in certain areas. It sounds like it’s a way to increase the size of menu items, book covers, and other parts of the user interface, similar to the system-wide font size option on Fire tablets. The user guide notes that large mode isn’t available for certain things, including the Kindle store, search, the vocabulary builder, and Kindle FreeTime. It will be interesting to see exactly how large mode works. Some folks have problems reading the small text in the dictionary pop-up, for instance, so this might help with that. Another new accessibility feature on the new Kindle Oasis is the ability to invert the screen to show white text on a black background. This was mentioned in the press release, and I thought it might get added to other Kindles with the latest update that added new boldness settings and more font sizes, but it wasn’t included in the update so I guess it’s going to be exclusive to the new Oasis, at least for now. Most people are familiar with the feature as night mode on tablets and phones. It’s not something you see very often on E Ink ereaders. A few Android devices have the option, and so does KOreader, but it’s not very common. The night mode hack for Kobo ereaders was fairly popular, but updates often break it and it doesn’t always work on certain devices so it’s kind of a hassle to deal with. I never really cared for night mode on E Ink because it has a tendency to cause more ghosting and afterimage effects, but on the InkBook Prime each page looks nice and clear so hopefully it works just as well on the new Oasis. The last main accessibility feature on the Kindle Oasis is the VoiceView Screen Reader. This is not new and is available on all other current Kindles as well, but it requires a USB audio dongle (aka Kindle audio adapter) with models other than the entry-level Kindle, which has Bluetooth instead like the new Kindle Oasis. 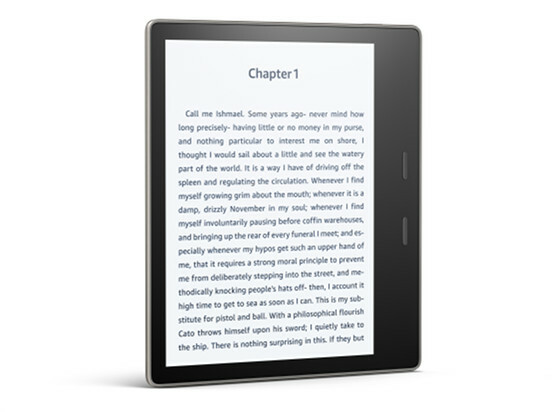 VoiceView is essentially text-to-speech but it’s designed exclusively as an accessibility feature that requires navigating the Kindle using special gestures while it reads everything on the screen aloud, including menus and selections. So far there’s been no indication that they’ll be adding regular TTS but all the features are already in place so hopefully it gets added eventually as well. That’s it. I’m buying the HECK out of the new Oasis now. I was apprehensive about it because my old one works just fine, but between Audible and Night Mode, I can’t see myself without it now! Thank you so much for all of this Kindle goodness, Nathan! is the new Oasis actually 7” or more like the Aura H2O at 6.7”? If they’d have used the 7.8″ panel, instead of a whole new one, the new Oasis would have been exactly the model I’d been predicting a couple months ago. (well, except for the Destination moniker). Reading while taking a nice hot bath! YES! That is what sold me. otherwise I would have passed.